With most cloud platforms, such as Google Cloud (GCP) or Microsoft Cloud (Azure), an SSH client is built-in. However, AWS does not include a built-in SSH client, and therefore requires you to use a third-party client in order to SSH into your EC2 instances. 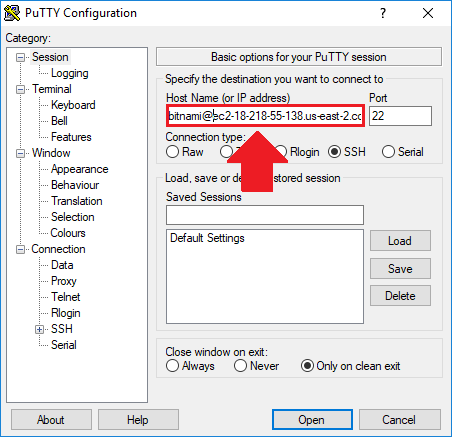 In this tutorial you will learn how use a third-party SSH client (known as PuTTY) in order to SSH into your AWS EC2 instances. Managing your AWS website’s files requires you to SSH into your EC2 instance. This can be achieved by using an SSH client such as PuTTY. If you prefer to use a cloud platform with a built-in SSH client, check out the Google Cloud (GCP) or Microsoft Cloud (Azure) tutorials. 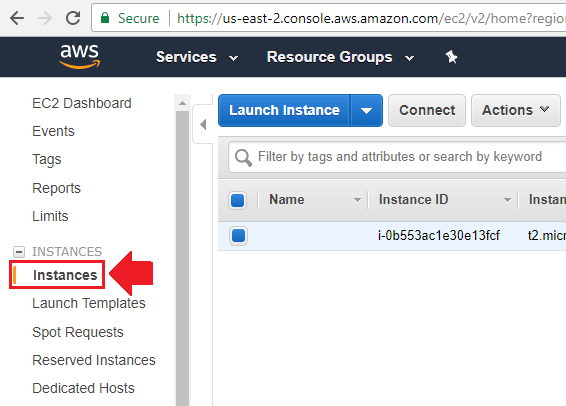 Before getting started with this tutorial, you should have already deployed an EC2 instance such as WordPress on Amazon AWS EC2. 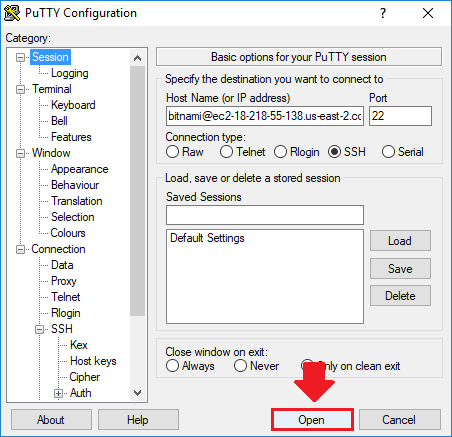 PuTTY is the application that you will use to SSH into your AWS EC2 instance. You can download it for free here. 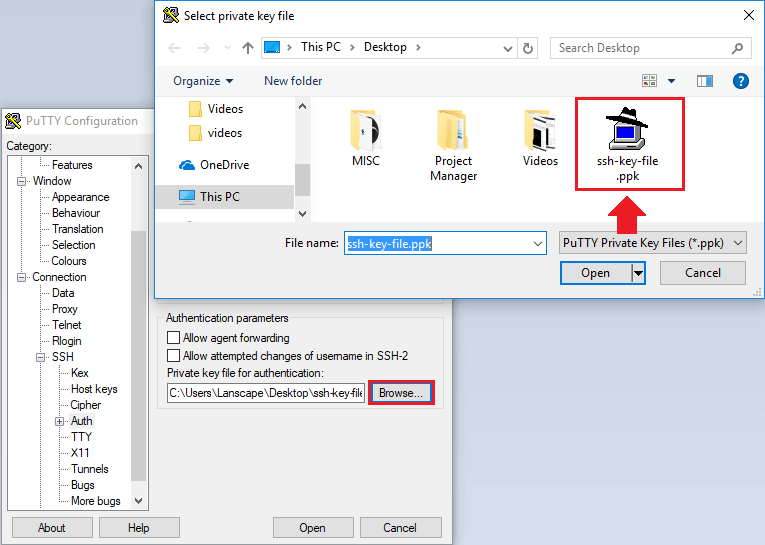 After downloading PuTTY, open the PuTTY Key Generator application (PuTTYgen), and click the Load button to upload the key file that you downloaded in the previous step. From your AWS homepage, naviagate to your EC2 dashboard. Click on Instances in the left sidebar menu. 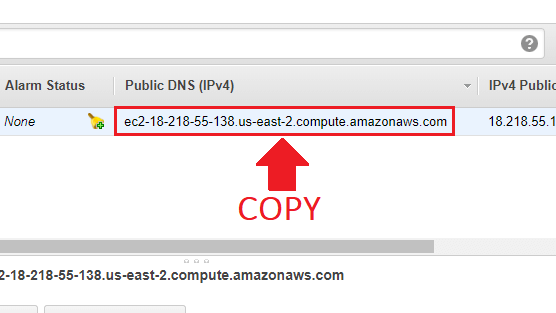 Copy your instance’s Public DNS IP address. Open the main PuTTY application and enter your username (see list) followed by @ and the Public DNS IP Address that you copied from the last step into the Host field. Next, navigate to the Auth section in the left-sidebar menu. Then, upload the PuTTY key file that you converted in the last step. Lastly, navigate back to the the Session section at the top of the page, and click the Open button to establish the SSH connection. • For an Amazon Linux AMI, the user name is ec2-user. • For a RHEL AMI, the user name is ec2-user or root. • For an Ubuntu AMI, the user name is ubuntu or root. • For a Centos AMI, the user name is centos. • For a Fedora AMI, the user name is ec2-user. • For SUSE, the user name is ec2-user or root. If ec2-user and root don’t work, check with the AMI provider. After you’ve successfully connected to your instance, you will see a window pop up with your instance details. From this point forward, you’ll be able to quickly SSH into your EC2 instance simply by loading your instance’s saved Public IP address from the PuTTY dashboard. how to open server,s configuration file please? I am referring to your tutorial on you tube. The part which starts after this tutorial here. So should I now be seeing my website auto-switch from not having a www. to having one if I just enter the domain name? I did these steps (plus a few further ones like pasting text into Putty that i saw on another version of this tutorial), but I’m still not seeing this auto-switching take place when I type in my domain. I just registered the URL today. Does it take a while? FWIW, it is showing up when I do either or, so it’s setup properly, but I just am not seeing this auto-switching. At the end of part 2 of this tutorial, I include a section on how to configure the redirect to the www. version of your domain. Also, remember to restart your Apache server after making the changes. That’s the tutorial I watched. I’ll try resetting the Apache server…but how do I do that???? Total noob here…where do I use this script? I literally have never even heard of this before, so details would be super helpful! I got it to work! I think the confusion comes from what appears to be a copy/paste error in your instructions in which you say to “copy the three lines of code below” in two consecutive screenshots, when the second one is just that one code to reset the Apache server. Sounds good Mike – I’m glad you got it working! Also, thanks for the feedback – I will look into updating the tutorial. You will have to manually generate an SSH key pair through your terminal. I want to test Amazon AWS thank you for your tutorials my friend. 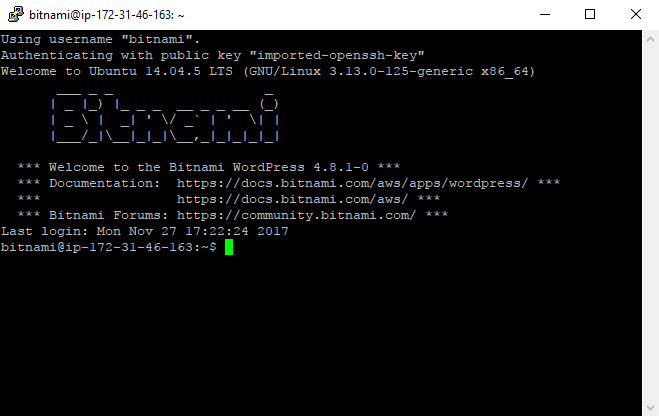 Once the SSH is setup here, can I then follow the SSL certificate, Filezilla setup tutorials on the GCP Bitnami? The SSL certificate tutorial should work (don’t quote me because I haven’t tested it), but there might be slight differences in the file paths. As far as the FTP tutorial is concerned, it will be similar but your username will probably be different (if bitnami doesn’t work, try ec2-user). The SSH usernames are issued by Amazon. There is a common list of usernames at the bottom of the tutorial page. Check out the documentation for more information on connecting to your EC2 instances with SSH.